Today, Paige shares a roundup of 8 fall fedoras under $50 (perfect for those bad hair days!). I'm thinking #4 has my name written all over it...share which picks are calling your name in the comments below! It all started when I was 16. I saw Meg Ryan strolling through Central Park in her bucket-stye fedora as Sally Albright in When Harry Met Sally, and I knew hats were going to be my thing. Twenty-five years later, they still are. 1. If the recent stretch of 80-degree days is any indication, we've still got some warm weather left this season. Before switching over to felt, consider this wide-brim straw fedora with a fall-hued band from Forever 21 (currently on sale for $10.99!). 2. For a hit of color, I love this brilliant red trilby-style fedora from San Diego Hat Company ($45). 3. Although I've never been able to pull off the floppy hat look, this black felt fedora from Old Navy ($19.94) will complete any bohemian fall look. 4. A neutral felt fedora is a must-have for every hat collection. 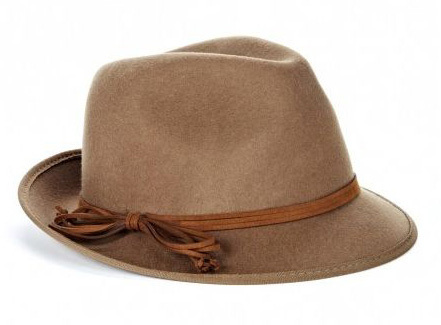 This camel fedora from Sole Society ($39.95) fits the bill perfectly. 5. 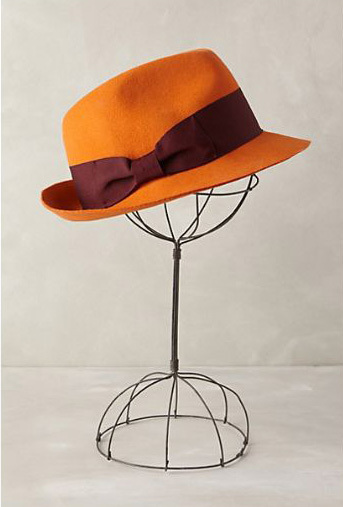 This tangerine fedora from Anthropologie ($48) makes me smile every time I look at it. 6. When it starts to get cold and snowy, I'll often wear a rancher style fedora rather than a traditional knit or fleece hat. This charcoal wide-brim fedora from the Gap (currently on sale for $10.17!) is perfect for that kind of weather. 7. When I saw this navy fedora with its delicate feather trim in person at Nordstrom ($38), I couldn't resist. A new addition to my collection!. 8. You can never go wrong with a classic black fedora, like this one from Urban Outfitters ($39). Image credits: all images per product links above.